I recently had a caffeine surge while filiming a Movement Snax video that resulted in a weird rant about moving the way we were designed to move. Really, my rant was more about not being afraid to move against the grain when it comes to all the weird movement rules we have accumulated over the years. Don’t squat past 90 degrees. Don’t let your knees go beyond your toes when you squat or lunge. Don’t lock out your elbows when you bench press. Don’t extend your neck and look up overhead. If you have arthritis, quit moving. Don’t swim until 30 minutes after you eat. Don’t pee in the dark. Ok, that last one was just to see if you were paying attention. Anyway, we have these rules for moving that are kind of weird. And before we go any further, I’m sure these rules have come from well meaning people doing the best they could with the information that where given at the time. The problem with these rules is that they become a blanket movement gospel that is never questioned and often applied over everything. But let us ponder for one moment. If we were not supposed to move in certain ways, why is it often so very natural for us to easily move in those ways that we shouldn’t? If we are not supposed to squat past 90 degrees, how come we are designed to? Why doesn’t our knee flexion simply stop at 90 degrees? Why do children and agile, able adults sit in a squat? Don’t they know this is bad for their knees? If we aren’t supposed to rotate our spines, why are our vertebrae designed to rotate? Doesn’t our body know this is a horrible idea? If we are not supposed to extend our necks and look up overhead, why are there birds? You get the idea, right? Our design seems to scream a great deal more wisdom than we often give it credit for. And, as seen in a small child, when fear is not present – when fear inspired information has not been collected – movement has no limitations. Our bodies are most free to move in every way imaginable and also unimaginable – without injury or damage. We are not fragile. Moving won’t break us. But not moving will. If there is a rule to movement it is this: Move. I should also add that some of the above rules, and many others not listed, are often given in the “exercise” world. And MAYBE some of them should be heeded (That’s loose maybe for me). But even still, exercise should not be confused with movement or the design of movement. Exercise is exercise, often needed for a body that doesn’t move. And if there are rules in the exercise world, perhaps that is where they should stay. I think if we open our eyes and minds and ponder how amazing our design is, we will begin to clearly see how we are designed to move. Maybe we will even move with carefree abandonment and experience the pure joy of our design. This is what did a long time ago, by the way. We simply enjoyed movement without fear and without rules. And more often than not, we kept a sense of wonder in our eyes and a smile on our face. There is really only one rule: Move. on January 15. She died 30 years ago. She wanted to be a dancer. I fulfilled her dream with a career in dance. To honor her spirit, my husband put on a Fred Astaire/Ginger Rogers video, we lit a candle and did our own crazy dance. My husband has suffered through 3 spinal surgeries in his youth and is working his way back to full body connectivity. Improvisational Dance(no rules) is his way(our way) in…………………. That’s really beautiful. Thank you for sharing this. beautiful, all of you. improv dance (and ecstatic) are indeed wonderful “tools”. Hi Tim, can I ask you a question? 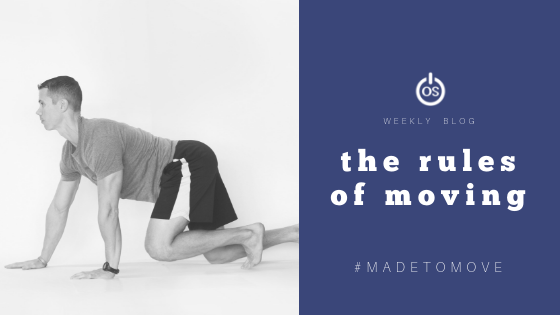 I had chronic back pain for years and fixed it by strengthening my trunk muscles and adjusting my daily movement habits, following Stuart McGill’s advice. The general advice is to bend at the hips, not twist the spine under load, etc. And I spent a lot of time relearning my daily movements until moving this way became habitual. I’m not sure if Mr McGill advises to be so rigorous (especially when unloaded), but that’s how I managed to fix my back. And as long as I stay within those guidelines, I don’t have any trouble from it. That said, I sit a lot for work, so my hips and shoulders etc. get tight. And when I get up and do the basic Original Strength routine (thank you for your books :)) of crawl, rock and roll, my body feels undeniably better. My hips loosen up. My posture improves immediately. My knees, even though I spend a lot of time kneeling when working, feel refreshed. So far, I have stayed away from windscreen wipers and any movement that rotates the spine – even when not under load. I’m even a bit scared of these movements now, even though that might sound ridiculous. But I’m also wary of limiting movement where it’s not necessary. Is this where you’d say listening to your own body and following its guidelines comes into play? I’ve always admired the simplicity of your approach to movement and health and would love to get your thoughts. Thanks for your books and free videos, and for the above article. I’ll do my best to answer your question, but my best answer is trust you. The great news is that we can often restore what we’ve lost through engagement. BUT, engagement in fear is just like engagement in pain to your nervous system – it will guard you and restrict you. Not what we want. So, if you are afraid to move into rotation, don’t. Deal with the fear first. This may just be letting it go or something even more laborious. Once the fear is gone, or you’ve decided you’re more curious to have a life with rotation versus one without, start with breath. Turn on your spinal stabilizers with your deep diaphragmatic breathing. Then add eye and head rotation (cervical spine rotation). Then go with egg rolls (thoracic spine rotation). Then maybe explore windshield wipers or lower body leg reaches across your body. But do it curiously and explore where you can go. Keep your movements small at first and let them teach you where you can go and what you can get away with. You may find that you can eventually roll anyway you want and discover other wonderful things as well. But don’t take what i’m saying as a “you need to roll!” mandate. Listen to you, trust you, and go from there. Does this make sense? Thanks for taking the time to reply Tim. What you said actually reminded me of how I’m trying to approach some gut issues I have. For the longest time I ate restricted diets to deal with Irritable Bowel Syndrome. This had benefits, but also came with its own problems, resulting in being fearful of eating certain kinds of foods. Recently I’ve been expanding what I eat through slow experimentation and focusing on the expectations/associations I have with various foods. And while it’s no cure, it’s been an incredibly freeing approach after so much restriction. Taking a similar approach to movement, as you described, makes a lot of sense to me. I think trust you, along with experimentation is probably sound advice. Thanks again for taking the time to reply, I really appreciate it. I can relate to what you have found with your “freeing approach after so much restriction” This resonates with me – and it sounds like joy. Would you mind if I use our conversation as an article or an inspiration for an article? This may be helpful to others.